No parent wants to be faced with the news that their toddler is heavily overweight. However, toddler obesity is a growing concern in the Western world and figures show it tends to affect boys more than it does girls. In the majority of cases, toddlers become overweight due to unhealthy diet and a lack of exercise. However, there is the possibility it could be caused by a medical condition. So, it’s important to seek a diagnosis from the doctor before you attempt to tackle the problem. This also helps to determine whether your little one is obese, or whether it’s a temporary growth spurt. Remember, all children develop at a different pace and body shape and size varies dramatically, just as it does in adults. 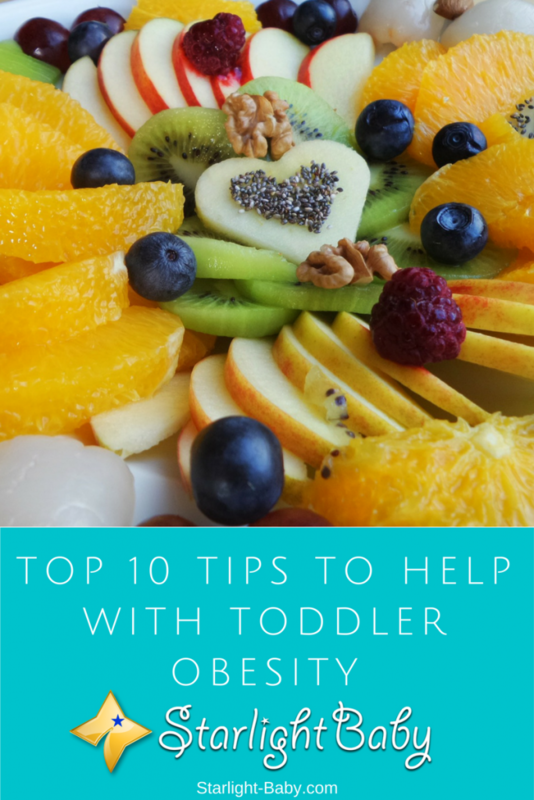 If you have been given a proper diagnosis and your toddler is suffering from obesity, below you’ll discover 10 tips that can help. As an adult, the thing we largely learn in order to lose weight, is that we need to follow a strict diet. There’s all kinds of fad diets out there which restrict or cut out completely, everything from fat to carbohydrates. These types of diets are NOT suitable for your toddler. Unlike adults, children are still growing, which means they need a lot of different nutrients to ensure healthy development. Putting them on a very strict diet therefore, could be far more detrimental to their health than the obesity itself. Toddlers do need snacks, but the type you offer could be contributing to their weight problem. Switch sugary snacks for healthy ones and this alone will make a massive difference. Let’s face it, it can be difficult to get toddlers to eat anything new, especially if it’s deemed healthy! However, there are plenty of healthy foods toddlers love that they may not realize just yet. Try bananas, strawberries, nuts, and carrot sticks dipped in a little hummus. By cutting out the sugar, you’ll also see an improvement in your little one’s behavior and they won’t be as hyperactive which is welcome news for worn-out parents! On the topic of snacks, even healthy ones can lead to over-eating if you give them too many. If you don’t already have one, come up with a set routine for meal times and snack times and try not to cave in. Having a routine lets you monitor how much your toddler is eating and is also great for behavioral issues too. It might not seem like it, but kids love routine! If you really want to help your toddler get healthier, it’s important to adopt the same changes in your own lifestyle. After all, toddlers are masters at copying the people around them. They look to you as a role model. So, if they see you snacking on unhealthy foods and eating something different to what they’re eating, they’re not going to like it. Making sure the whole family joins in and eats the same, healthy foods, will really help to prevent meal time battles. The digital age has proven to be a sanity-saver for parents. Now, it’s easier than ever before to keep your little ones distracted and entertained. TV, tablet devices and smartphones are often used as a distraction technique and have taken over many households. The trouble is, all of this stationary activity spent staring at a screen is limiting the amount of physical activity toddlers get each day. Not only is it reducing the amount of exercise they receive, but it’s also bad for their eyes and development if too much time is spent in front of a screen. So, limit the use of smartphones, tablets and TV to around 15-30 minutes a day. Toddlers love nothing more than to play and explore the world around them. Spend more time playing together, kicking a ball around and participating in more active games. Involve the whole family and combine exercise with family bonding. You could go on walks together or for a bike ride. Make it fun and try not to do too much too soon. Increase yours and your toddler’s activity levels gradually, otherwise they will end up dreading activity time and have a meltdown whenever you even suggest doing something remotely physical. It can be difficult knowing exactly how much your toddler should be eating. It’s easy to give them the same portion sizes as an adult, forgetting they have much smaller tummies. The Dietary Guidelines for Americans is an excellent resource, offering advice on the average toddler portion size. Many of us grew up in a “you must eat it all before you leave the table” mentality. However, without realizing it, you could be forcing your toddler to eat much more than they actually need. Your little whirlwind isn’t going to starve themselves, so try to be a little more relaxed around what they should be eating. We’ve already established that increased physical activity should be gradually introduced, but the same applies to any change in routine. A sudden change can leave your toddler distraught and they may flat out refuse to take part in this new healthy lifestyle. The trick is to make small, gradual changes so it almost goes unnoticed by your toddler. Sure, you want your toddler to cut down on unhealthy foods, but banning them entirely could become problematic. Just like an adult diet, toddlers can have everything in moderation. It’s simply a matter of changing your attitude towards the treats you provide. For example, let them eat a chocolate cookie every now and again as a special treat. As long as you’re not giving them unhealthy treats every day, it’s perfectly fine to indulge a little every now and again. You can make all of the changes you like at home, but it can quickly go out of the window when your toddler is around friends and family. Be sure to let everyone know about your new healthy snack and reduced screen time rules. Making sure everyone treats your toddler the same will really help to reduce conflict and they’ll be more likely to keep on track of their new healthier lifestyle. Overall, it’s not easy tackling toddler obesity, particularly if your toddler has developed unhealthy habits. However, the tips above can really help. Remember that it’s not about how your toddler looks. Babies gain a lot of weight and this is usually lost once they hit the toddler stage, but it’s not going to disappear overnight. Many toddlers still carry their excess baby weight for a while so just because they may look a little overweight, it doesn’t mean they actually are. It’s more about how easy they find it to move around. Always get a proper diagnosis and ask your doctor for advice on feeding plans and activity tips if needed. My baby was 7 kilograms when he was 3 months. People said the baby will grow into an obese child. However, we have not changed the diet and we feed the baby as long as he wants to be fed. We believe once the baby beings to crawl or walk he will burn more calories and thus, will lose weight. However, our assumption could be wrong and the baby could continue to gain weight and become an obese child. One of the ways to control child obesity is by feeding more vegetables and protein-based diet instead of carbs.